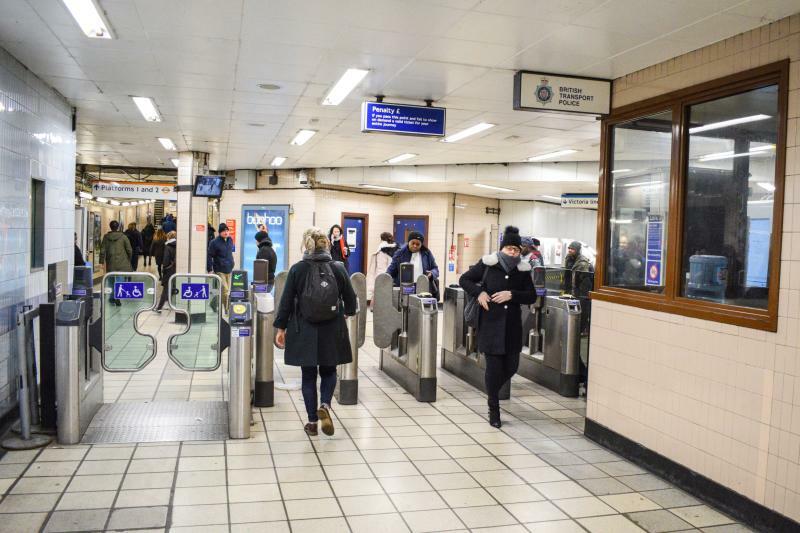 In just six weeks time its the Victoria Line’s big anniversary. 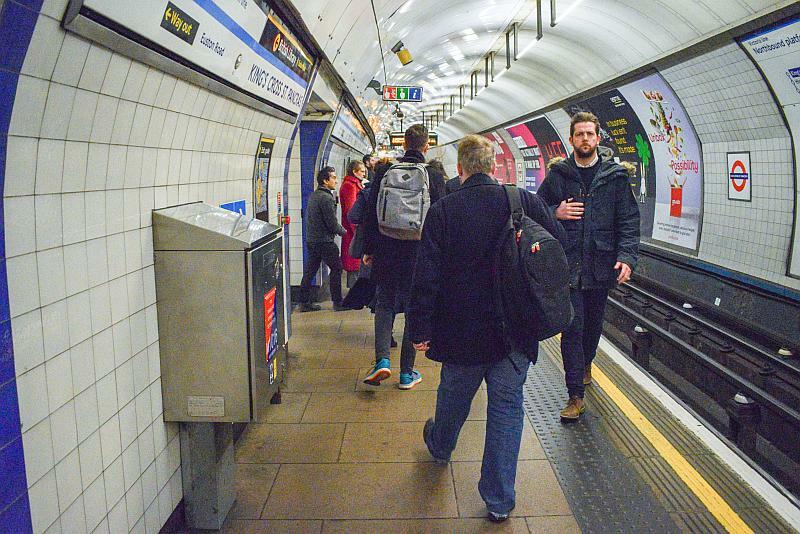 The 1st September last year was commemorated with celebrations by Victoria Line and TfL staff and included special publicity, posters, special birthday cakes, speeches and so on. The one in December was missed off because its not really significant enough and anyway it wasn’t until the Royal opening itself that the Victoria Line really took off because by this time the whole media were watching as London’s opened its brand new underground railway – and the event was reported world-wide. I have published several posts for this 50th anniversary year and this is yet another! It’s a round up covering what I think are unique aspects of the Victoria Line (although one or two of these others will generally know about anyway.) So let’s get into it! We start at Walthamstow and progress down to Brixton. It is often said the Victoria Line hasn’t got any surface buildings besides Blackhorse Road. That was entirely true when the line first opened but its a little different these days. The new surface buildings at Walthamstow Central. 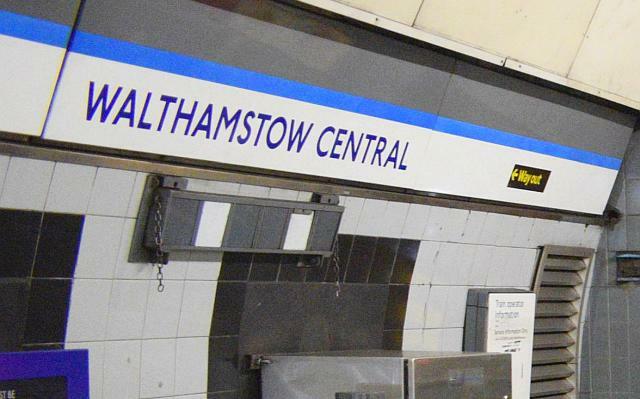 Walthamstow Central first opened without any surface buildings – the only access at the time was via the railway station itself – this access is still in use of course. However a new surface building combining both Victoria Line and bus station facilities was built with lifts and stairs to a new ticket hall underneath Selborne Road opened in 2007. Thus the Victoria Line these days has two successive stations with visible surface buildings – although one’s take on what constitutes a surface building is down to personal preference. The original 1968 train indicators at Walthamstow – though they are no longer used. 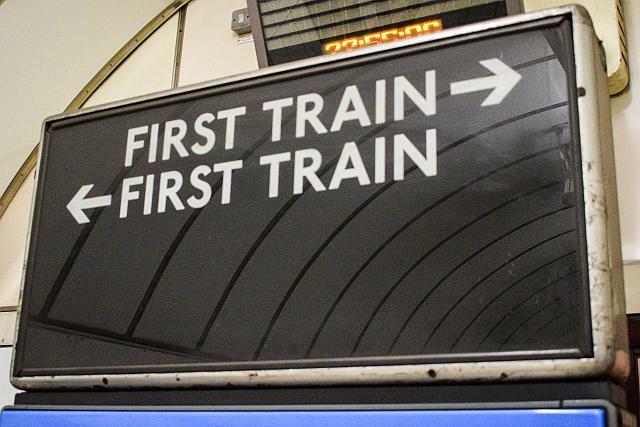 Interesting signage which is found at several other Victoria Line stations as well as Walthamstow. Blackhorse Road had these large 1969 posters installed above its escalators for the September celebrations – and its certainly unique because these were big versions of the nominally smaller ones that could be seen in those days. See my 2018 post for another picture of these. Big 1969/72 posters at Blackhorse Road! 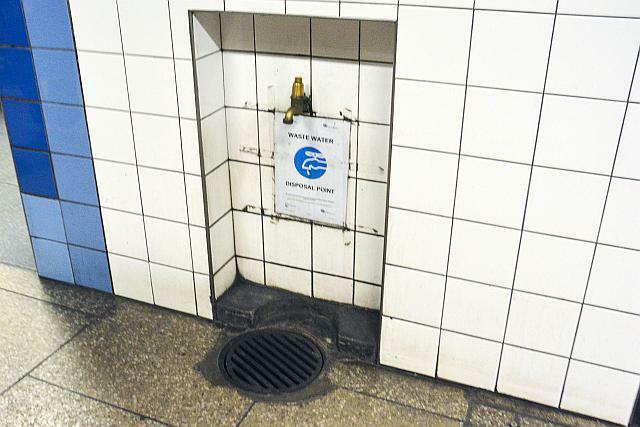 Several of the stations are showing their age and Finsbury Park, Vauxhall and Oxford Circus are the main examples where tiles have fallen off or water ingress has damaged the walls and fittings have had to be removed, exposing the original 1968/69 stying beneath. At Tottenham Hale they had covered up most of the original decor but recently had to remove an advertising module for some reason – and one can see the original decor behind. Original 1968 decor exposed at Tottenham Hale. Its certainly back and its older – but is it funnier? Seven Sisters is quite a substantial station and it does indeed have a surface building of sorts though this is shared with the main line railway. Its also unusual having a BTP office right by the gateline. I do not think there’s any other tube station in London with a BTP presence in such close proximity. Finsbury Park (and Highbury too) is an interesting case because the Victoria Line here constitutes of a station built 115 years ago! Its been much modernised now however elements of the original station for the Great Northern and City and Piccadilly Lines can still be seen, including these subways and stairs that link the ticket office and the platforms. 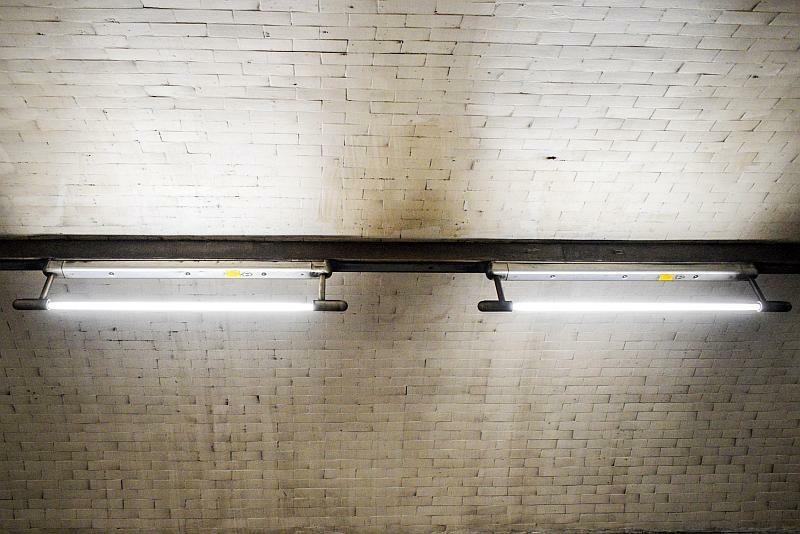 Subway built in 1904 with original glazed tiling! How much longer will it stay like this? The 1904 stairs down to the southbound Piccadilly/Victoria Lines. 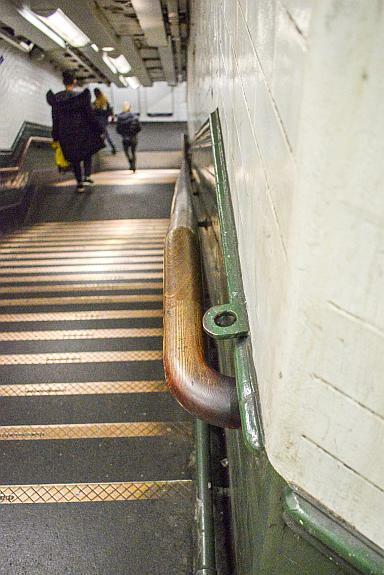 The only example of wooden handrails on the whole of the Victoria Line! Its decorated in the same cream/green style but what I noticed recently was this bracket set in the wall. Was it once part of a gate? And now for the next picture…. you might think this is somehow taking the piss but no its not! 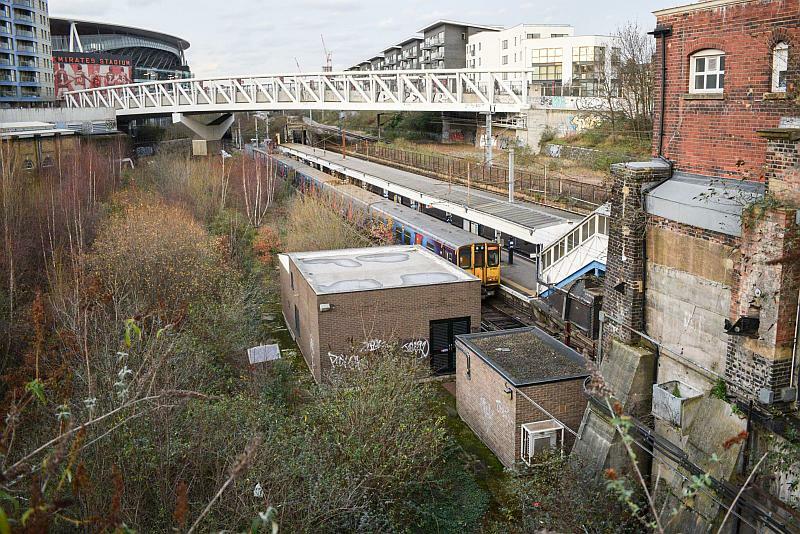 Yes its Drayton Park station on the Great Northern Line – but did you know the brick building to the side of the train standing in the station happens to be a Victoria Line substation? Its an ideal spot because the tube line runs directly beneath. Victoria Line substation at Drayton Park. King’s Cross (and Oxford Circus too) are some of the line’s most heavily used stations. I have noticed the placement of certain equipment cupboards at these stations leads to massive overcrowding because they stick right out into the rather narrow platforms themselves and everyone has to squeeze past! That on the northbound platform at Oxford Circus is a massive, massive, massive, bug bear and no doubt this at King’s Cross too creates a major pinch point as people try to squeeze past each other! Major pinch point at King’s Cross caused by the Victoria Line’s own infrastructure! 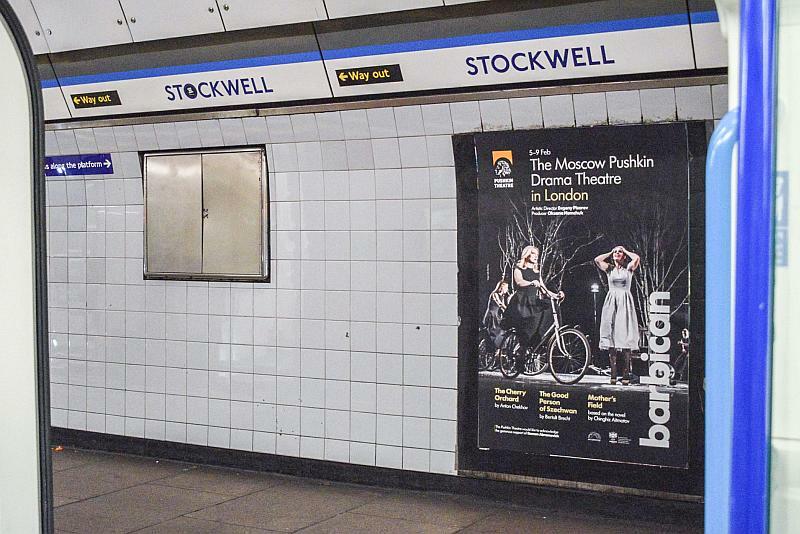 Despite modernisation at King’s Cross they slipped up and installed signs on the Victoria Line platforms saying ‘Regent’s Park!’ It should have read Regent’s Canal. 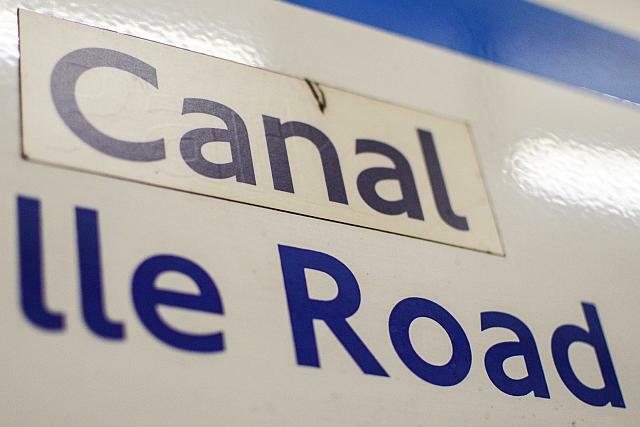 Simple solution – get a few labels with ‘canal’ made and stick them on top of the erroneous text! See my post on this. 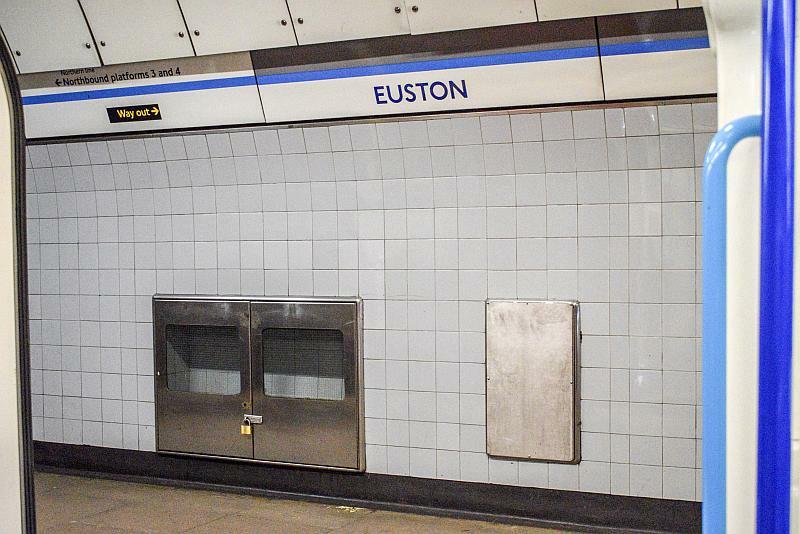 Many of the Victoria Line stations are adorned with these little cupboards built for the line in 1968 and which seem to have no purpose these days! Several of these huge stainless steel cupboards used for fire fighting equipment can be seen at the line’s stations. This is Euston again and there’s another at Victoria. These stainless steel cupboards were obviously produced in quite large quantities for the Victoria Line. Although this was part of an attempt at standardising the stations it was also an exercise at reducing the line’s construction costs. Just after Warren Street the Victoria Line passes close to the British Telecom Tower, another famous sixties icon. This is a wide angle view of the tower from the top end of Fitzroy Square at the point the line passes beneath before sweeping in a wide arc round the tower towards Oxford Circus station. The BT Tower – made more accessible by the opening of the Victoria Line station at nearby Warren Street. The next picture is without a doubt one of my favourites. 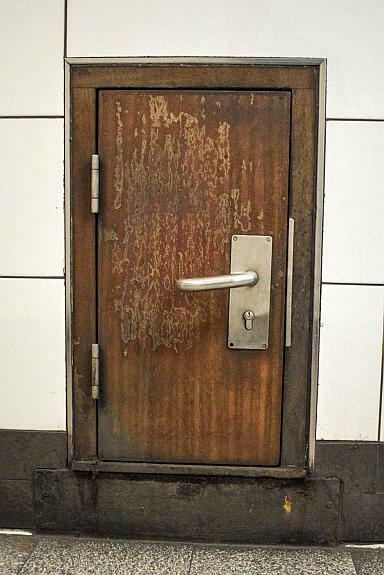 Its a small door probably sixteen inches high (perhaps a third of a metre) at Oxford Circus station. I couldn’t tell you what it is used for! Tiny door just off the Victoria Line’s northbound platform at Oxford Circus. Green Park comes complete with a water tap on the northbound platform and its a unique feature deep down in the tube – although many above the surface stations do have these. I sometimes wonder if this is a shower for the small people that might use the little door at Oxford Circus? I’ve often wondered about this. Its some sort of indicator (letters or numbers that can be slotted into place) at the end of the southbound platform at Victoria. 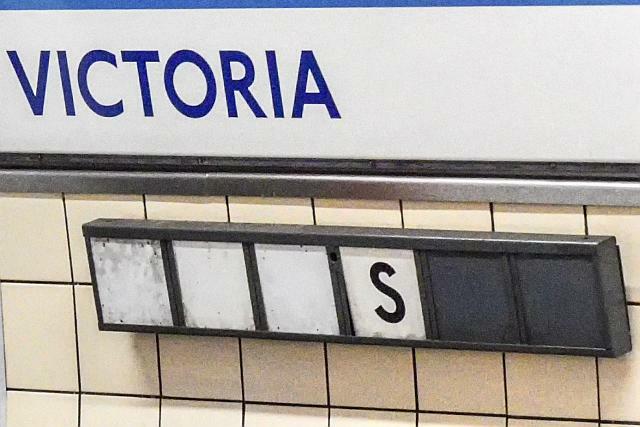 Initially I thought this strange indicator was probably just used for the four short years Victoria was the line’s original terminus. However its incorrect as some other pictures of Victoria station though not specifically showing the indicator closely do at least show the letters have been altered – which means its still serving some purpose. There is also one at Walthamstow as this next picture shows. I checked that at Victoria and they are definitely out of use – someone has removed the ‘s’ – perhaps its gone to LT at Acton! Strange train indicator at Walthamstow Central. Pimlico has quite a few features that are unique to the Victoria Line. It was the last station to be opened yet its the only one that still has rear lit roundels once seen at the other fifteen stations on the line! 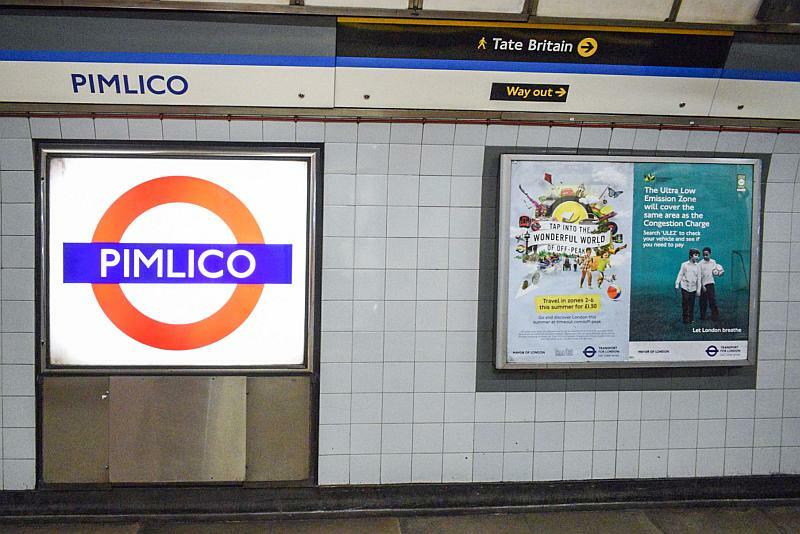 Pimlico with one of its rear lit glass roundels. 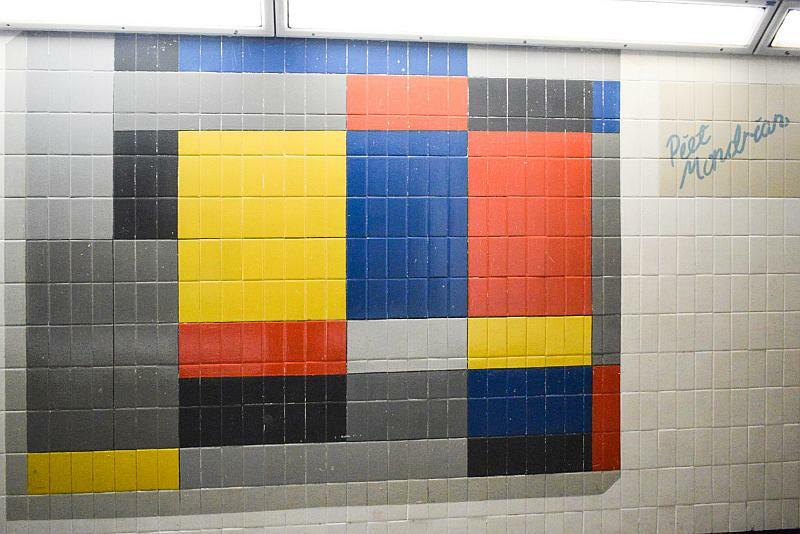 The proximity of the Tate to Pimlico means there’s a whole station subway adorned with tiled versions of famous art. This is Mondrian. 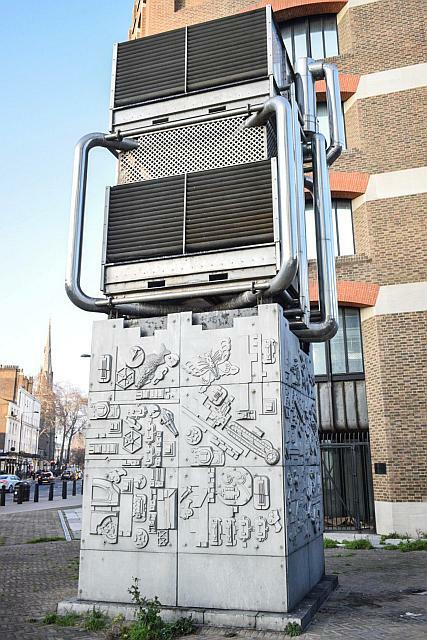 Eduardo Paolozzi’s vent shaft built in 1982 for the Victoria Line at Pimlico. I think it replaced a simple brick built shaft. 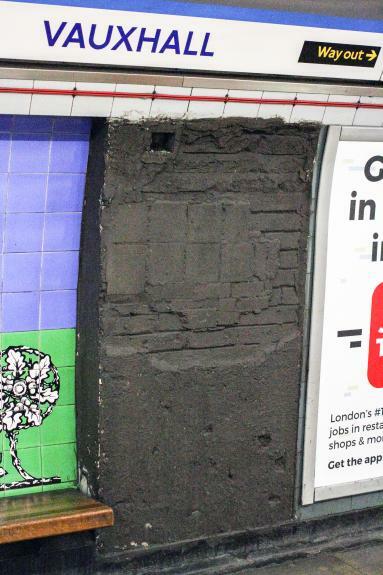 When the tiles and the concrete rendering started falling off at Vauxhall, TfL simply painted these areas of the station’s bare walls with what looks like rubberised bitumen. Cheap, nasty and certainly unique for the Victoria Line! A little cupboard at Stockwell! There are a few of these that are high up. Somewhere for platform staff to store their sandwiches and drinks? Everyone knows Brixton is the southern end of the Victoria Line – or is it? This is the furthest the tube trains can go beyond Brixton station. Its a ventilation and emergency access facility and is thus the southernmost surface building on the Victoria Line. It can be easily seen from a main line train heading towards Herne Hill station. The tunnels themselves end just a short distance beyond the building. The other end of the line at Walthamstow simply ends in tunnel there are no surface buildings of any sort. The air shaft for this section is sited in Selborne Road on top of the tube station itself. There’ll be a couple more posts before the big anniversary, including the line’s first 50th celebrations that took place last September – and something that’s not ever been written about. Previous Post: 345 driver confused at Stratford? Well done for demonstrating how little TFL intended from the very beginning to spend on the poor people living at the ends of the line, and the extent to which they have continued with this attitude. 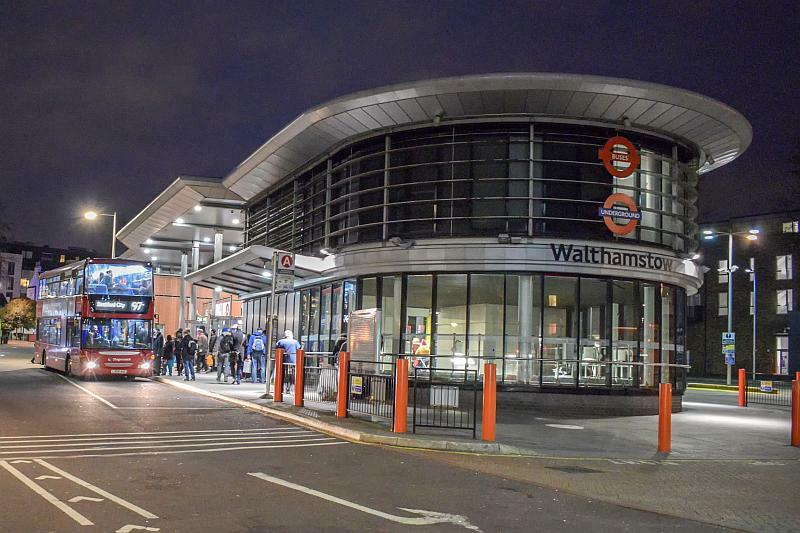 BTW, the above-the-ground structure at Walthamstow, though providing an entrance to the tube, is actually part of Walthamstow BUS station ….. I do know it is part of the bus station but it is still a visible surface building for the Victoria Line much like the minor one at Pimlico. 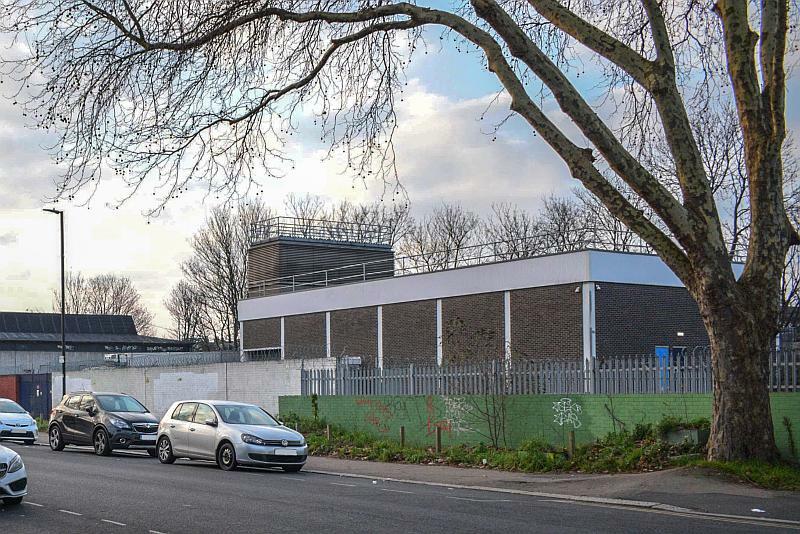 Its of course not a major surface building like Blackhorse Road but nevertheless an improvement and one which gives the Victoria Line a visible presence in the centre of Walthamstow. I’m not sure what you mean by TfL not spending much for the poor people at the ends of the line. Yes the line could have been better and served more of the local communities however TfL wasn’t around in the sixties so it could have not authorised or even had the Victoria Line built. That was the job of both the government of the day and the London Transport Board. 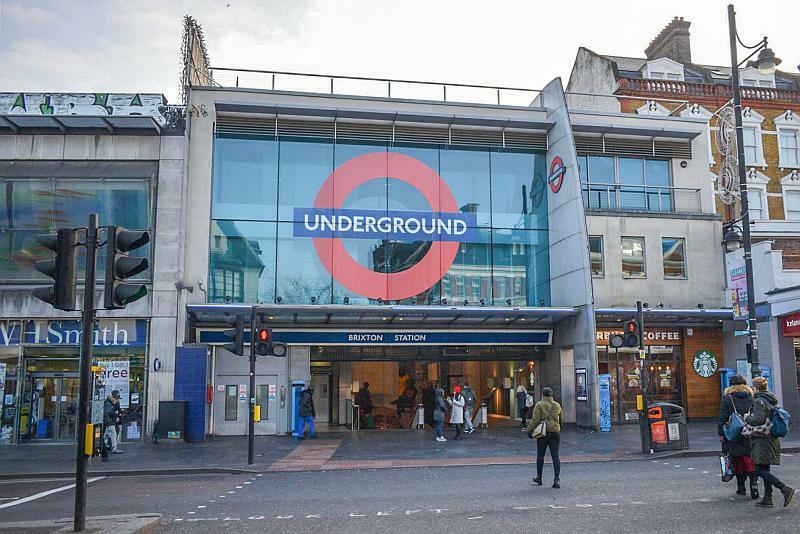 The picture of Brixton Station shows tfl’s largest roundel. At least I think it is, until someone shows otherwise. I think it is the biggest! Both Wood Lane and White City have quite large ones though not as big as this.